Films based on life events like The Imitation Game (reviewed yesterday) are most inspiring just when the doldrums of winter can get the most depressing. 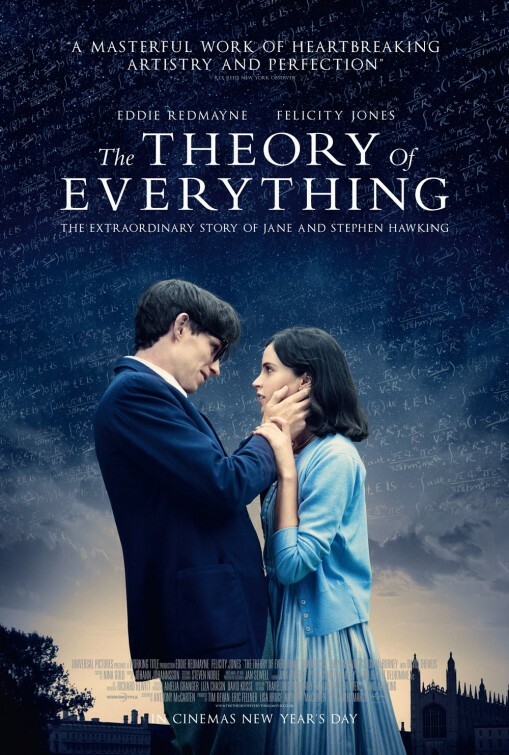 Another famous scientist with an inspiring story is that of Stephen Hawking, the focus The Theory of Everything reviewed below by Ron Wells.Coming up in the near future is a review of other films based on true stories like Wild, about Cheryl Strayed’s 1100 mile journey on the 2700 mile Pacific Crest Trail as well as reviews of Mr Turner the painter, and Foxcatcher about psychopathic billionaire John du Pont and his relationships with, and manipulation of, America’s two best Olympic wrestlers Subscribe and get these reviews and more in your in box! The Theory of Everything tells the story of Stephen Hawking, the brilliant physicist who was theorizing on the space/time singularity and seeking one equation to prove that time had no meaning, when he was stricken with motor neuron disease and given only a short time to live. The movie follows Hawking and Jane Wilde, the love of his life, as they try to adjust to his condition while keeping him, and their love, alive. Played to perfection by Eddie Redmayne and Felicity Jones—award nominations will be forthcoming—it is impossible not to care for these two as they try to live their lives in as normal a way as possible, while Hawking continues his research into time and space.The film is put together in such a way that the scientific aspects have parallels to the all too human emotion of the beginning and ending of love. Wonderful film.